Job seekers are welcome to come meet with more than 70 local employers hiring for full-time, part-time, seasonal and internship positions. Employment opportunities in childcare, education, local government, IT/computer science, mental health, fitness, healthcare, personal care, hospitality, retail, public safety, sales, and skilled labor will be showcased. 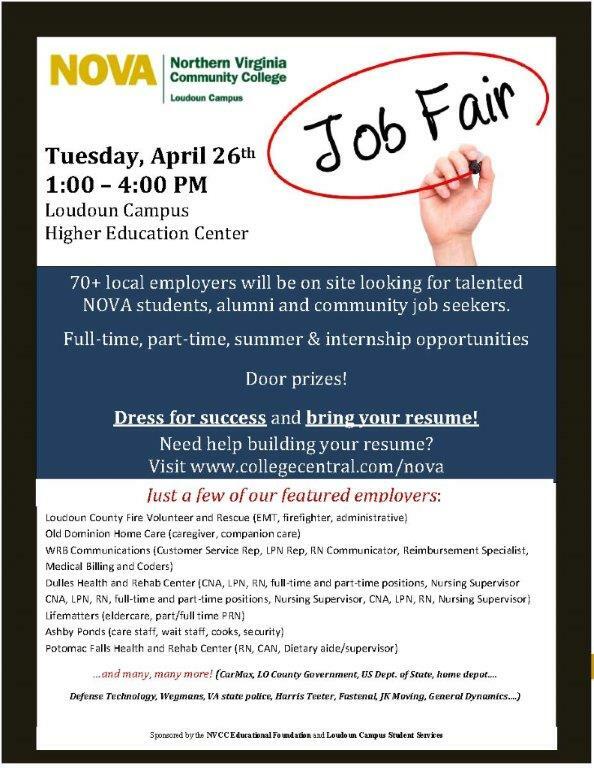 Among the featured employers: CarMax, Defense Technology, Fastenal, General Dynamics, Harris Teeter, Home Depot, JK Moving, Loudoun County Government, Top Golf, U.S. Department of State, Virginia State Police, Wegman’s and many, many more! Please stop by the table and meet LT Jae Wah. The Nurse Candidate Program provides a monthly stipend for full-time students in accredited Bachelor of Science Nursing programs accredited by the Commission on Collegiate Nursing Education (CCNE) or the National League for Nursing Accrediting Commission, Inc (NLNAC). Students can enroll after their sophomore year and receive an initial grant of $10,000 (paid in two installments of $5000 each), plus $1000 a month for up to 24 months. After graduation, participants join the Navy Nurse Corps as an Officer, with the opportunity to earn a competitive salary, regular promotions, comprehensive medical and dental coverage, low cost travel opportunities, excellent retirement and educational benefits, further training, and a rewarding clinical practice. Additional benefits include 30 days of paid vacation a year, use of military recreational facilities around the world, the opportunity to serve around the world in a variety of facilities, and be a part of supportive team of highly trained professionals. • You must be a U.S. citizen. • Cannot have reached your 42nd birthday by the time you are commissioned and on active duty. • You must be able to meet the Navy’s physical fitness standards. • You must be enrolled in an accredited educational program resulting in a BSN within 24 months of starting the program. • One to 12 months of NCP scholarship results in an Active Duty Service Obligation of 4 years. • Thirteen to 24 months of NCP scholarship results in an Active Duty Service Obligation of 5 years. Once enlisted into the NCP Program, you are assigned to Navy Medicine (NM) Accessions Department. The NM Accessions staff are responsible for all aspects of your career in the NCP and transition to active duty. As a member of NCP you are a member of the Individual Ready Reserve (IRR) at a rank of Officer Candidate Under Instruction Second Class (OCUI2). Time in this program does not count for retirement or pay purposes (longevity). Please note: Once enlisted in the NCP, your recruiter has no responsibility for you or your career. Please do not send transcripts or other documents to your recruiter. All correspondence and discussion regarding your career in the Navy is conducted with the NM Accessions Department. 1. Signing Bonus. Each NCP participant receives a $10,000 (taxable) signing bonus. Your first $5000 is paid within 2-4 weeks of your benefit start date if we have received your NCP enlistment documents, and the second $5000 is paid after 6 months in the program. 2. Stipend. NCP participants receive $1000 a month (taxable) paid in $500 increments on the 1st and the 15th of the month. Your stipend stops on your graduation date. You will receive no further money until you report for active duty. 3. Tuition, Reimbursement, Annual Training. NCP participants are NOT ENTITLED to tuition payments, reimbursement for books, fees, equipment, etc., or annual training. 4. ID Card. As a participant in the IRR you are eligible for a Reserve Identification Card (Reserve ID Card). As a member of the IRR, you are permitted unlimited use of military commissaries, exchanges, and recreational facilities (Army, Navy, Air Force, and Coast Guard). Your ID card is your key to using these facilities. There are many exchanges and commissaries scattered around the country which provide significant savings. For information on how to obtain an ID card while in the NCP, please click here. 5. Obligation to Serve on Active Duty. NCP participants sign a contract to service on active duty commensurate with the length of the benefit received. Up to 12 months of the NCP benefit results in a 4 year obligation. Any benefit over 12 months results in is a 5 year obligation to serve on active duty. IV. Program Requirements. Failure to comply may result in termination of your scholarship. 1. Information and Status Changes. While in the NCP program, you are required to keep the Accessions Department informed of changes in academic status, address, telephone number, e-mail address, dependency status and physical condition. Any changes to the above should be sent via e-mail to USN.OHSTUDENT@MAIL.MIL. You must have approval from the Program Manager, NAVMED Accessions Department BEFORE you change your program, school, length of time in school, or graduation date. Requests should be sent in writing to the NAVMED Accessions Department Registrar via e-mail at USN.OHSTUDENT@MAIL.MIL. Request should be sent a minimum of 6 months prior to the requested change. • Physical Condition Changes. Any changes in your physical condition must be reported immediately to the NAVMED Accessions Department Medical Section. All medical documentation should be scanned and e-mailed to USN.OHSTUDENT@MAIL.MIL unless otherwise directed. • Annual Verification. A year before you graduate, you will be e-mailed an Annual Verification Package. Please fill out all the forms in this package and return them within 2 weeks to NAVMED Accessions Department Medical Readiness Section via scan and e-mail to USN.OHSTUDENT@MAIL.MIL or secure fax: 301-295-5954. Directions on how to complete the forms are included in the e-mail to you. • You are required to send in your transcript after each semester/term. An unofficial transcript (web/screen shot) is acceptable, unless otherwise requested by NM Accessions Staff. • You must maintain a 3.0 GPA while in the NCP. Failure to meet the academic requirement may result in placement in a Leave Without Pay Status (LWOP) and could result in separation from the program. If you are having difficulty completing your courses or maintaining a 3.0 GPA, contact the NCP Career Counselor immediately in order to develop an academic improvement plan. 1. Active Duty Assignment Duty Preference Sheet. The Duty Preference Sheet is a document in which you provide information about your preferences for your first active duty assignment. It will be sent via e-mail by the NM Accessions Department NCP Career Manager 6-7 months prior to your graduation. Guidance and information on how to fill in the document will be sent with the Duty Preference Sheet. You must send the Duty Preference Sheet back to the NCP Career Manager by the listed due date. Do not contact the Detailer directly until you have been told to do so. • School Graduation. All NCP participants must successfully graduate with a 3.0 GPA or higher. Immediately following graduation, you must send the NAVMED Accessions Registrar an official final transcript showing your BSN conferral. • National Council Licensure Examination (NCLEX). All NCP participants must pass the NCLEX before they can be commissioned and receive orders to their first duty assignment. It is anticipated that you will take and pass your NCLEX within 45 days of graduation from your nursing program. The NM Accessions Department NCP Career Counselor must be notified as soon as you have your initial NCLEX results. Failure to pass the NCLEX could ultimately result in dismissal from the NCP Program and the Navy. District Office closest to the participant’s school. A house hold goods move is one of the entitlements of your orders to active duty. Your orders contain information on how to schedule your move and other important information. Please read them carefully. Please note: NCP graduates DO NOT REQUIRE a commissioning physical as stated in the orders. Your physical into the NCP program and your annual verification cover this requirement. If you have questions, contact the NAVMED Accessions Department NCP Career Counselor. • Commissioning. All successful NCP graduates are commissioned as an ENSIGN (ENS), USN by their Navy Recruiting District closest to their school. (NCP Participants with prior commissioned service may be commissioned at a higher rank based upon instructions current at the time of commissioning.) Commissioning involves making a sworn pledge to support and defend the Constitution of the United States. Signing your Oath of Office bestows a commission upon you as an officer in the United States Navy. It is signed before you report to Officer Development School. Please note: You will receive no pay or benefits as an active duty officer until you report to ODS. Please plan accordingly! Fill out your 2016-17 FAFSA Now! 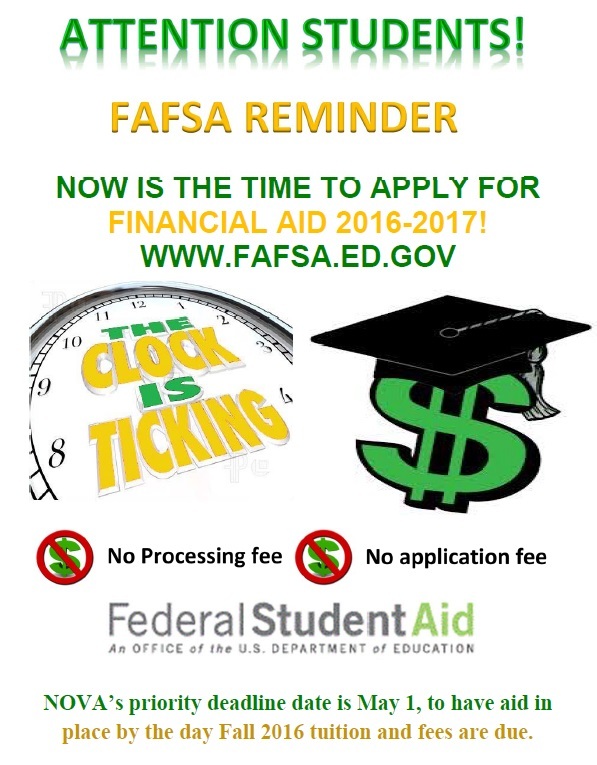 If you have not done so, now is the time to submit your 2016-17 FAFSA! NOVA’s priority date of May 1, 2016.